Luke Macnamara, "'My Chosen Instrument': The Characterisation of Paul in Acts 7:58-15:41", Analecta Biblica 215; Gregorian Biblical Press: Rome 2016. Luke Macnamara, "Levi's Banquet: A Model Eucharist", Worship 92 (2018) March, 14-25. Luke Macnamara,"Proverbial Patience: The Paradox of Job", Doctrine and Life 67/5 (2017) May-June, 47-57. Luke Macnamara, "Mercy in Action: the Parable of the Good Samaritan", Catholic Medical Quarterly 66/4 November 2016. Luke Macnamara, "Unexpected Guests at the Birth of Jesus", Doctrine and Life 65/10 (2015) December, 2-14. Luke Macnamara,"How the wind blows? God's role in human origins and humanity's response: Qoh 11,5" Biblische Notizen 152 (2012) 67-86. Luke Macnamara,"Sulla Regola della Comunità 1QS in confronto con la Regola di san Benedetto", Vita Monastica 65 (2011) 5-23. 2018. Luke Macnamara, Review of Stanley E. Porter. John, His Gospel, And Jesus. In Pursuit of the Johannine Voice (Grand Rapids, MI / Cambridge, UK: Eerdmans, 2015): Irish Theological Quarterly 83/1, 102-104. 2016. Luke Macnamara, Review of R. Bauckham, Gospel of Glory. Major Themes in Johannine Theology (Grand Rapids, Michigan 2015): Irish Theological Quarterly 81/3, 321-323. 2016. Luke Macnamara, Review of The New Testament and the Church. Essays in Honour of John Muddiman. (Ed. John Barton and Peter Groves) (LNTS 532: London 2016): The Furrow 67/6, 379-381. 2016. Luke Macnamara, Review of: Thomas J. F. Stanford, Luke's People. The Men and Women who met Jesus and the Apostles (Eugene, OR: 2014): Irish Theological Quarterly 81/1, 111-112. Luke Macnamara, "Levi's Banquet: a Model Eucharist." Address at the annual meeting of the Irish Bishops' Council and Committees for Liturgy at St Patrick's College, Maynooth, Ireland on 17th November 2016. Luke Macnamara,"Mercy in Action: the Parable of the Good Samaritan." Address to the Irish Catholic Doctors Learning Network. May 2016. Luke Macnamara,"A Study of the Community Rule (Qumran 1QS) and a Comparison with the Rule of Benedict". Address at the Monastic Institute Study Day at Collegio Sant'Anselmo, Rome on 6th May 2010. 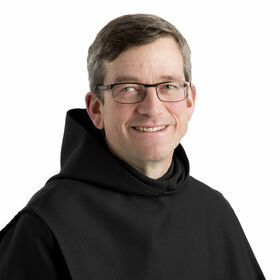 Monk of Glenstal Abbey, professed in 1999. Undergraduate studies at the Institute Catholique de Paris (BD); graduate studies at the Pontifical Biblical Institute in Rome and Jerusalem (SSL and SSD). Medical doctor. Undergraduate studies at University College Dublin (MB BCh BAO); graduates studies in General Practice (MICGP). President, National Association of General Practice Trainees (1996-1997). Teacher and Learning Support Coordinator, Glenstal Abbey School (1999-2001, 2005-2008). Member, Taskforce on Dyslexia (2000-2001). Lecture in Sacred Scripture (2015–present). Member, Irish Biblical Association (2015–present). Member, Catholic Biblical Association of America (2016 – present). Member, Society of Biblical Literature (2016–present). Member, Irish Catholic Doctors Learning Network (2015–present).